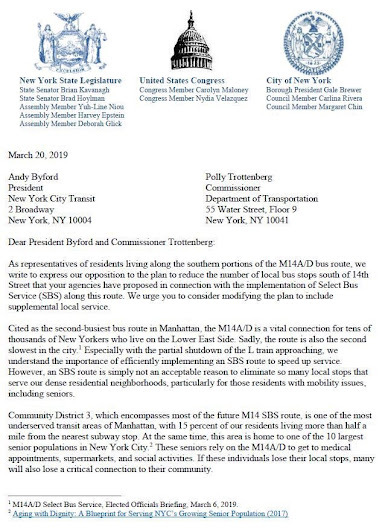 Last month, the MTA presented a preliminary proposal for permanent M14 Select Bus Service (SBS) on 14th Street. 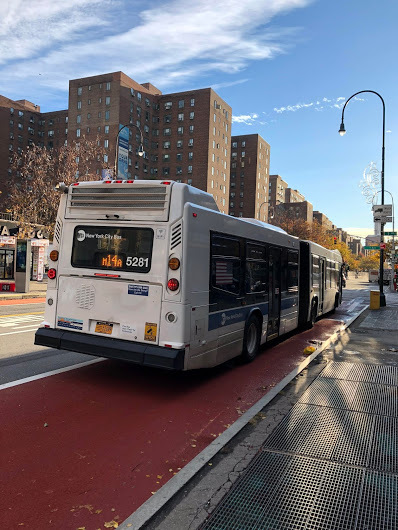 Currently, the new planned SBS route calls for fewer stops by the M14, particularly in the East Village and Lower East Side, as well as off-board ticketing. 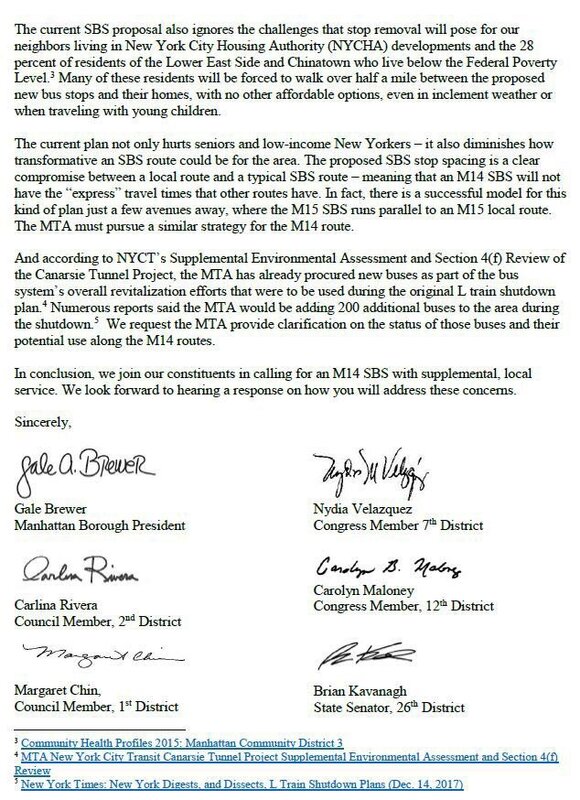 The MTA has not decided yet whether it will eliminate current M14A and M14D service following SBS implementation. But, officials at the meeting said the authority was “open” to that idea. The elimination of service/stops along the M14A and M14D routes isn't sitting well with local elected officials. This afternoon at 1, several of them — including City Councilmember Carlina Rivera, State Sen. Brian Kavanagh and State Assembly Member Harvey Epstein — along with other community leaders are gathering on the northwest corner of Avenue A and Fourth Street to call for "a new M14 Select Bus Service (SBS) plan that retains local bus service while creating a new, faster SBS alternative with fewer stops." The rally comes on the heels of a letter urging the MTA and DOT (see below) for a "real M14 SBS." 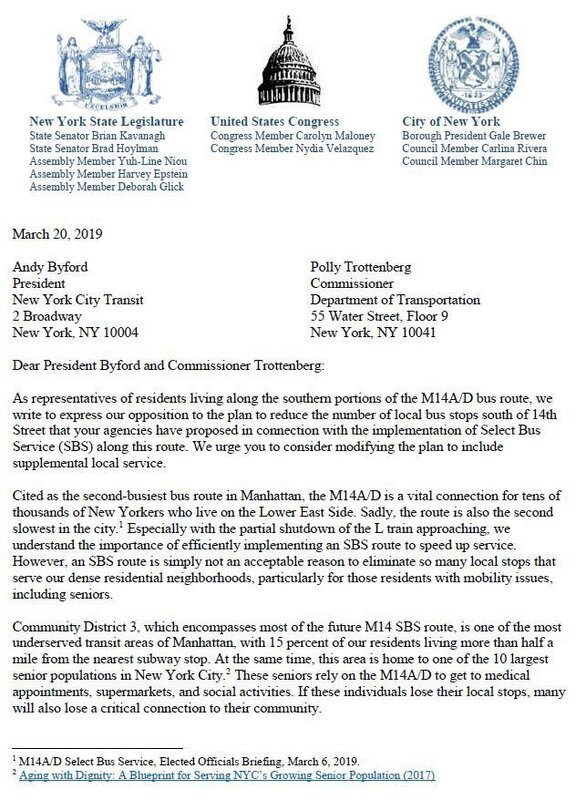 Community District 3, which encompasses most of the future M14 SBS route, is one of the most underserved transit areas of Manhattan, with 15 percent of our residents living more than half a mile from the nearest subway stop. At the same time, this area is home to one of the 10 largest senior populations in New York City. These seniors rely on the current M14A/D to get to medical appointments, supermarkets, and social activities. If these individuals lose their local stops, many will also lose a critical connection to their community. The current proposal also ignores the challenges that stop removal will pose for our neighbors living in New York City Housing Authority (NYCHA) developments and the 28 percent of residents of the Lower East Side and Chinatown who live below the Federal Poverty Level. A real M14 SBS with supplemental, local service, would service these populations while improving on the proposed SBS plan, which is currently a clear compromise between a local route and a typical SBS route – meaning that the proposed M14 SBS will not have the “express” travel times that other routes have. Geez, it’s bad enough we already don’t hav3 local service at 9th Street on First and Second Aves and have to watch a zillion Select buses sail past before we get a local. What is wrong with these morons?